Legend is that Piety Thomas Smith was named after her father. Her first name, according to a website called “Behind the Name”, is from the English word meaning devoutness and was a name used by the Puritans, or Protestants, in the 17th & 18th century. 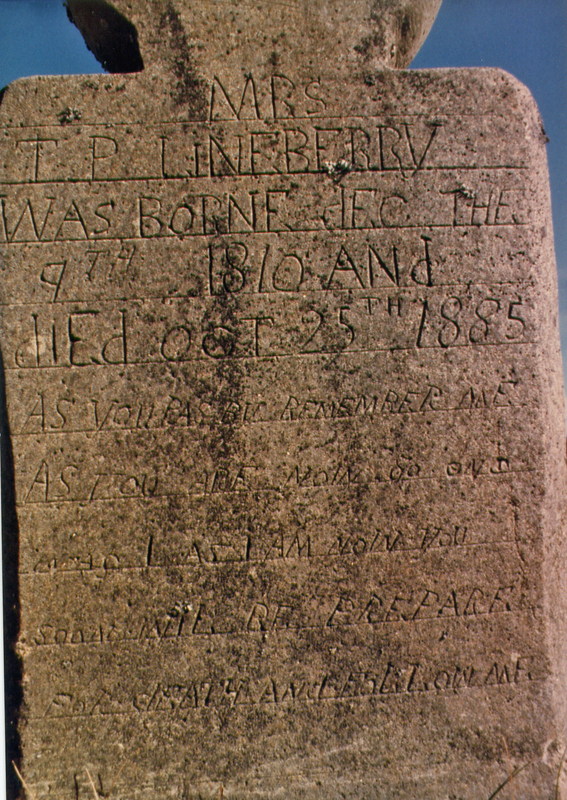 Piety was my great, great, great grandmother and she married Jacob Lineberry. 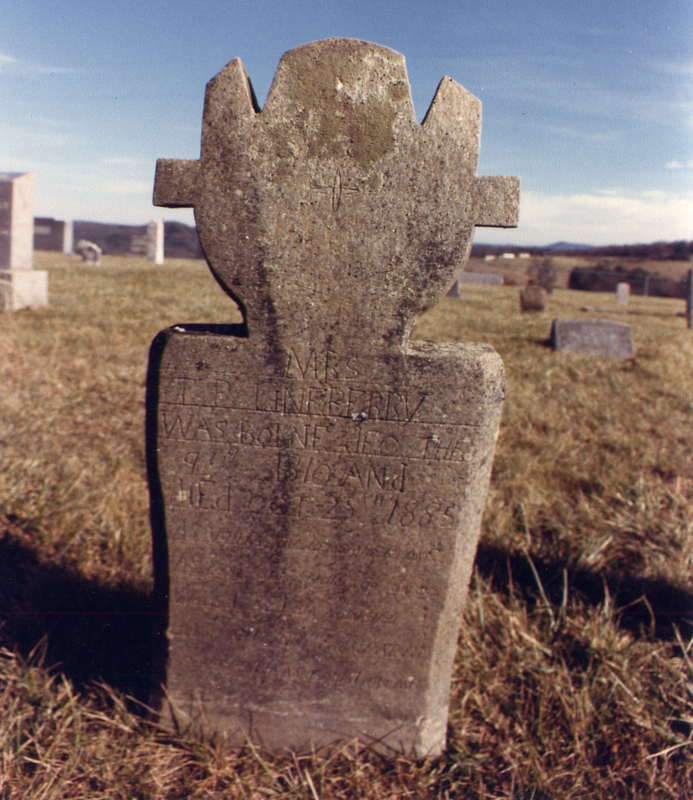 In 1885, at the age of 74, she died and is buried in the Hebron Cemetery, which is located near Galax, Carroll County, Virginia. Interestingly, her headstone has her initials reversed as if her name was Thomas Piety Smith. The design seems to be a head & shoulders style wearing a crown with a cross in the middle of it. If it is a crown, it symbolizes reward or glory in the afterlife. If it is a cross, it is a symbol of Christianity or suffering. The markings on the stone have all been made by hand and the use upper and lower case is in unconventional places, making it more difficult to read. for death and follow me. And so, these are stones which are designed not only to record the life of the person who’s died, but to remind the reader that you, too, are mortal. And so you’d better prepare for death. JOANNE SILBERNER: Because death — especially from disease or accident — could appear at any time, and many people died young. But as life got easier and religion lost some sway over peoples’ lives, headstones got less threatening, more ornate. In way, more comforting, says Wells. ROBERT WELLS: By the end of the 18th century you move away from the more kind of harsh puritan notion of predestination, to be condemned to hell, to a gentler, more unitarian theology, where salvation is more likely to be guaranteed. And you can see this on the grave markers. Hi there! I am also descended from Piety Thomas Smith Lineberry (she & Jacob’s daughter Catherine Lineberry Burnett was the mother of Emaline Elizabeth Burnett Roberts, my great-great grandmother. Do you have any more information about Piety or Jacob or other ancestors? Any information at all would be appreciated. Thanks so much! Within those are blog posts are links to other information that may be of interest to you. In my database I have that Catherine and Terry Washington Burnett had a daughter named Elizabeth born about 1865, is that your great, great grandmother? Here’s a link to my database entry for Catherine, will you review it and share with me information you have to help fill in the details for this line? You can reply through that the K Bauman Tree House (using the ‘suggest’ tab), reply here or use my email address, which is on both sites. I hope you find something helpful to you.